Cats love climbing, but it isn’t all about fun. There are some important physical and psychological reasons behind why they do it. It’s also in their genes. Climbing keeps the peace. Cats living together use height to show their status in the family hierarchy. This prevents fighting. However, the same cat isn’t always on top; there are several reasons why they change position. What is important is that at some point each is able to be the cat at the top. Climbing keeps them safe. Cats feel safe up high where they can have a good view of the world around them. Being high up also provides an escape from dogs and other dangers. Climbing keeps cats warm. Heat rises, so on cold days the perches at the top are cozy. Climbing keeps them busy. This is particularly important for cats whose parents work all day, or cats who are kept indoors; they’re easily bored and put on weight. A good climbing frame can provide hours of fun. 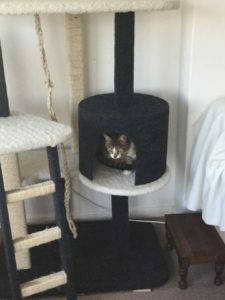 The easiest, of course, is to check out the wide selection of Scratz Me castles and climbing frames available at EberVet Vetshops. We can also order if we don’t have what you need immediately available. 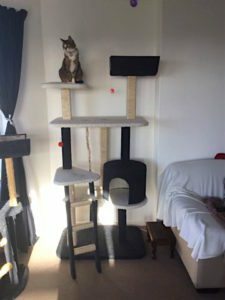 Scratz Me castles and climbing frames are premium quality so your cat can climb safely and securely. Alternatively secure shelving at different heights around the perimeter of a room in your home. 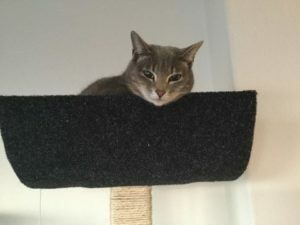 Place the shelves near enough to household furniture such as bookshelves and dressing tables so that it is easy for your cat to climb or jump up onto them. Remember to cover the shelving with a non-slip surface like sisal or carpeting, and if the cat is old and not as agile any more, secure some shelves at a lower level for easy access.